Princess cut engagement rings are non-traditional but are also classy and stylish. Some people desire non-traditional engagement rings that are a bit different. The round solitaire diamond is a beautiful classic engagement ring style and chosen by many people. Diamonds are versatile and can be cut into a variety of shapes. A relatively new style that is very popular these days is the princess cut diamond. Princess cut engagement rings are growing in popularity. They are square-shaped and have flat tops. Basically, princess cut engagement rings are a combination of two kinds of diamond cuts. The step cut results in parallel designs that run the length or width of the diamond. Ridges form on the perimeter of the diamond but the top remains flat. The brilliant cut adds more facets to the diamond. The brilliant cut is recognized by its triangular shape. Princess cut engagement rings have sharp corners. Unlike rounded diamonds, princess cut diamonds have angles. Because of this, princess cut engagement rings can be more prone to damage. The corners are fragile and susceptible to chips. Princess cut engagement rings are usually set with prongs protecting the corners for safety. The corner prongs offer protection against damage. Another option is to have the corners slightly rounded. The rounded corners are less damage prone and don’t have to be mounted at the corners. Some princess cut engagement rings are also set using channels. This means the diamonds are set into the band and not supported by prongs. Because of the shape of the diamonds, several can be fitted onto a band. The result is a sparkling row of diamonds. This setting is also popular with men’s wedding bands. Princess cut diamond engagement rings are customizable and can be paired with various diamonds and precious stones to produce a unique style. Are Princess Cut Engagement Rings Expensive? Princess cut engagement rings vary in cost. The mixed cut of the design (step and brilliant) affords many benefits not offered by other rings. Princess cut diamonds hide imperfections that would be noticeable in diamonds of a different cut. For example, princess cut engagement rings can contain flaws, inclusions, and discolorations which all go unnoticed. This is good because imperfect diamonds cost less than perfect diamonds. 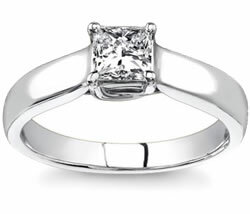 As a result, princess cut engagement rings can be inexpensive but still stunning. Another bonus is that princess cut rings are inexpensive to shape. The square shape is less damaging to the diamond. It’s quicker to create and easier to shine and polish. It’s also easier and quicker to create elaborate shapes. This results in reduced cost; however, the cut of the diamond isn’t the only factor to consider. In some cases, princess cut engagement rings use additional side stones which can inflate the price. Because of this, relatively inexpensive princess cut rings can end up costing more in the long run. No matter the price, princess cut engagement rings are stunning. Any bride or groom would feel like royalty wearing such a gorgeous ring. Remember that almost any setting can be made to fit a princess cut diamond. If you have any questions regarding princess cut diamonds or princess engagement rings, contact us toll free at 1-877-877-4141.